Visitors have a special opportunity to enjoy something truly smelly: the U.S. Botanic Garden plans extended hours for the blooming of the corpse flower. 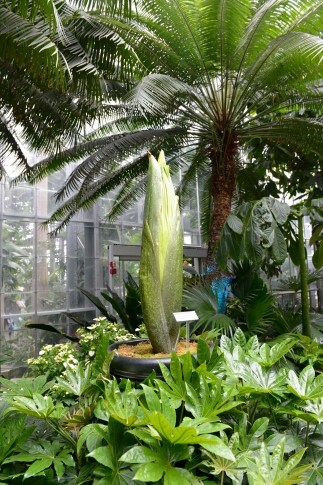 WASHINGTON — Visitors are being given a special opportunity to enjoy something truly revolting: the U.S. Botanic Garden plans extended hours for the blooming of the corpse flower. The Amorphophallus titanum typically blooms for 24 to 48 hours and is most odoriferous at night. Peak bloom is estimated to occur July 28-31. “We’re open until 8 p.m. every night while the flower is getting ready to bloom. As soon as we see it’s going into its ‘stench cycle’ let’s call it — we’re going to stay open until 11 o’clock at night,” said Ari Novy, the executive director of the U.S. Botanic Garden. Past experience suggests the plant will be smelliest between about 9:30 p.m. and 10 p.m. Some describe the scent as a combination of garlic, fish, diapers and rotting meat, according to U.S. Botanic Gardens exhibits specialist Devin Dotson. The plant releases a low-level odor during the day. This particular plant is precocious according to Novy because this, its first bloom, is happening at 6 years old, when some plants may take decades to bloom. Also, it’s expected to reach six feet tall, when the flower on younger plants tends to be smaller. “So, we’re looking at a little bit of a prodigy,” Novy said. Especially warm temperatures this week could accelerate peak bloom predicted for as early as Thursday. The U.S. Botanic Garden is on the southwest side of the U.S. Capitol at 100 Maryland Ave. SW.
And here’s a bit of trivia: “It’s actually not one single flower even though it looks like it,” Novy said. “It’s a collection of about several hundred flowers that combine into one floral organ.” That makes the corpse flower the largest of its kind (unbranched inflorescence) in the plant kingdom.